We’re never more than 70 miles from the sea in Britain, so the saying goes. 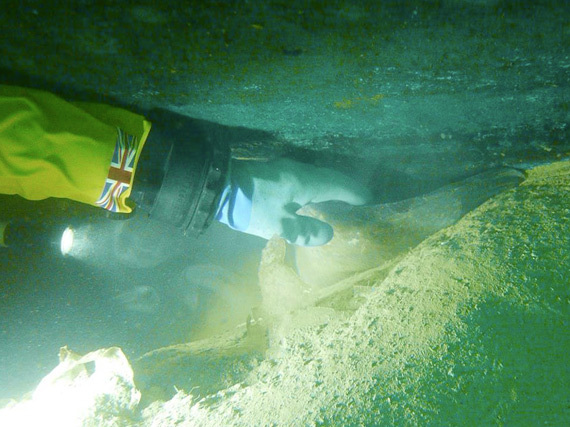 Unfortunately I currently live about 70 miles from the sea – which is a bit of a barrier to regular dives offshore. Inland living focuses the mind on local lakes and waterways, and there’s a surprisingly rich biodiversity here, if you know where to look. There are many species of fish in the lakes and reservoirs across England, including pike, perch, roach, tench and carp. Freshwater mussels are found in vast numbers, and crayfish populations infest riverbanks and flooded quarries almost everywhere. 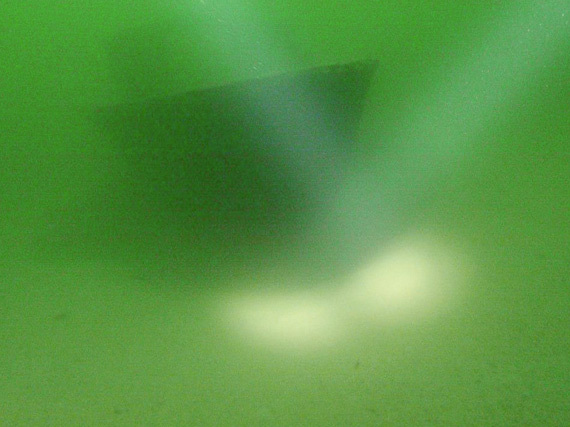 Alan – my regular dive buddy – has been diving in this particular lake in Hertfordshire for almost 30 years. It’s a former cement quarry which closed in the 1930s and was left to flood, and has been a popular beauty spot ever since. Today the water still contains a few pieces of quarry machinery, a few rusted cars and a few beer bottles thrown in by bored anglers. We met up every weekend to explore, using a map he’d sketched back in 1991 to navigate around the various features and contours. Usually we’d go away satisfied at spotting a large pike or two: these large predators are always fun to eyeball when hovering in mid water with a menacing glare. Then one day Alan told me that a large catfish also lived in the lake. 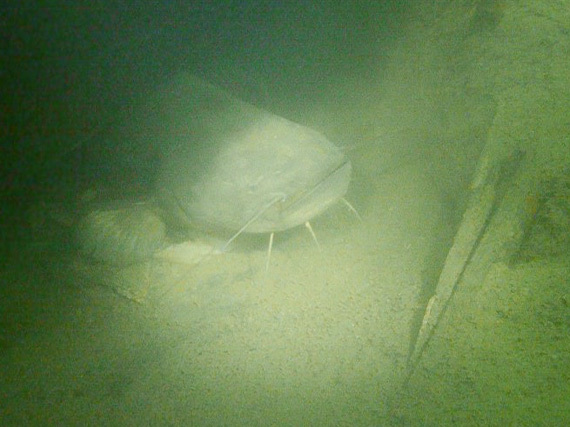 I’ve seen a few different freshwater species in my years of lake diving including carp and sturgeon, but a catfish was new. The Wels Catfish, to be precise, is not indigenous to the UK but was brought here during the Victorian era from Eastern Europe for aquatic display. Since then it has found its way into lakes and rivers nationwide, and is prized by anglers as a rare catch. These creatures have no natural predators and seemingly keep growing while there is a food supply, which is why animals six foot or more in length are quite common. I was hooked, to use a fishing metaphor. But was there a catfish here? 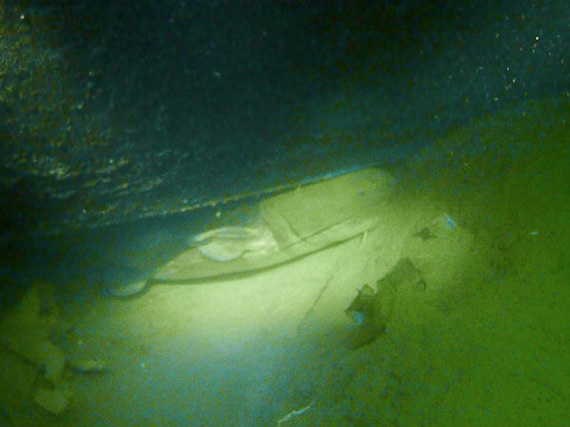 Fellow divers claimed to have spotted it beneath the wreck of a cabin cruiser in the centre of the lake. Weeks and months rolled past with no sign of any catfish, nor even disturbed sediment. It started to seem fanciful that such a big creature could inhabit a fairly small lake and yet remain inconspicuous. After two years of regular diving here, one Sunday in October 2017 and as usual, Alan and myself made our way towards the wreck – one of us either side. Through the gloom I brought my torch up and shone it against the base of the hull and the lake bed. And I saw there was… something. My squinting eyes focused on a whiskery face the size of a rugby ball. 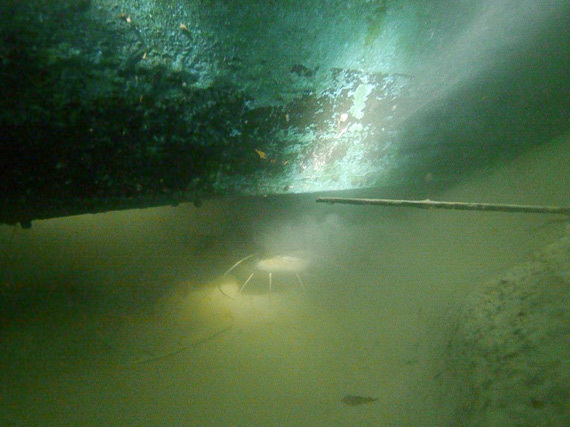 In the glare of my beam the fish thrashed violently to stir up a protective cloud of silt, and visibility was gone. Since that initial sighting, we continue to look for the catfish, week in week out. It has shown itself several times, although only once leaving the safety of the hidey hole. In that instance Alan stroked its tail and the startled fish bolted past me. My best estimate of the disappearing creature puts it at about six feet long. Seeing such a large creature in a wild environment is quite a privilege. Although fresh water diving may not appeal to many divers, the Wels Catfish is a good reason to take the plunge close to home. Nb – I have deliberately left the name of the lake out of this article, as I don’t want to encourage anglers!